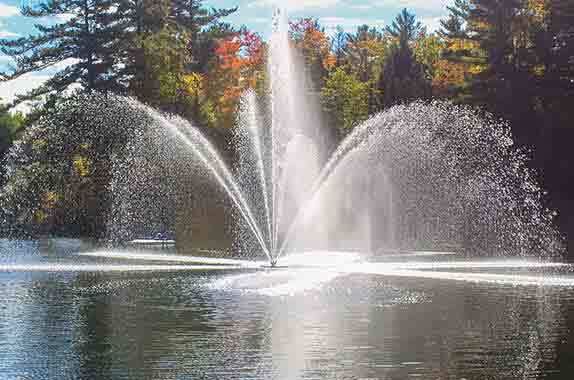 Why should you choose an Arbrux Floating Lake Aerators? Floating Lake Aerators adds oxygen to water, reducing algae, discouraging water breeding insects such as mosquitoes, and eliminating odor problems associated with stagnant water. Lake aerators also provide a healthy home for desired aquaculture by preventing stratification in lakes where sedimentation is a problem. Powerful propellers pump large water volumes through a drive structure into the air, offering an economical and efficient means of keeping any lake crystal clear and healthy. Aeration is a cheaper, more effective, and a greener alternative to chemicals and lake heaters. Arbrux floating lake aerators are easy to set up and maintain, and provide safe, clean, and clear water features for you to enjoy year-round. It doesn’t matter if you have a community lake, a golf water hazard, a municipal park lake, or a private lake at your residence; Arbrux lake aerators are versatile and work for a variety of applications. Simply let us know what your needs are and we will gladly customize a solution for you and provide a quote.